Increase self esteem, protects from negative energy, open the mind to new thoughts and promotes clarity. Calms and soothes distressed conditions. Overcomes depression, digestive problems, supports stomach, spleen and pancreas. The prime CASH, wealth stone. 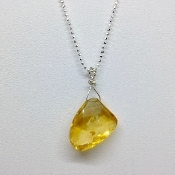 Brazilian Natural Citrine on 925 silver adjustable chain 16 inch length. Center stone: 17mm (at widest point) x 15mm.